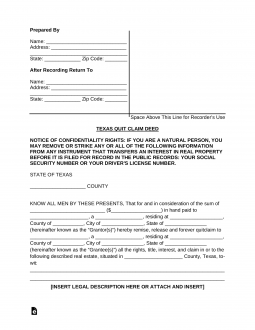 The Texas quit claim deed allows property to be transferred from a Seller (the “Grantor(s)”) to a Buyer (the “Grantee(s)”) by way of a 2 page document. The form must be completed with the individual who prepared the document, the parties’ names (Grantor(s) and Grantee(s)), and a detailed legal description of the real estate (descriptions are usually provided by the Local County Records). Once the form has been completed it should be signed by the Grantor(s) with a notary present and then it is ready to be filed with the Recorder’s Office. There will also be a required filing fee depending on the county it is being submitted (recommended to simply bring a blank check). 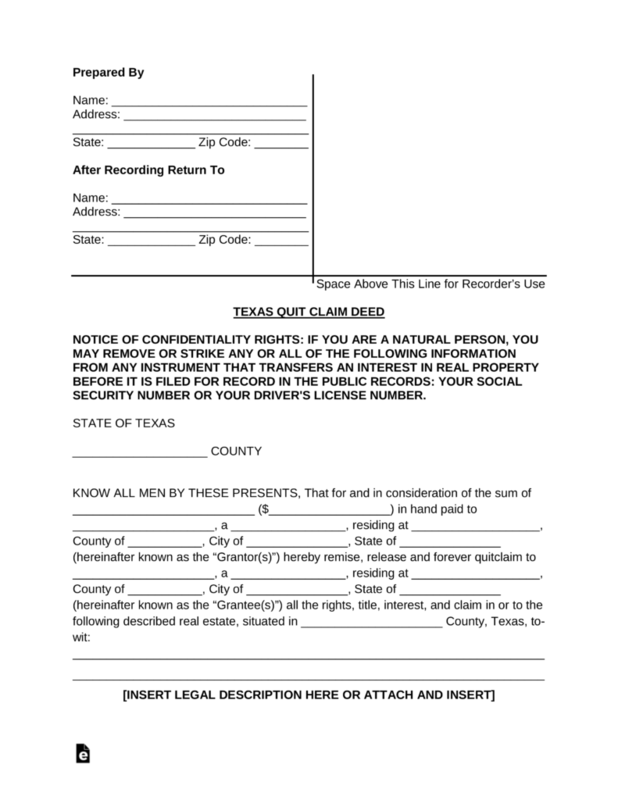 Recording – This form must be filed at the Recorder’s Office in the County Clerk’s Office. Signing (Section 11.002(c)) – The Grantor(s) has the choice of authorizing this form in the presence of Two (2) Witnesses or a Notary Public. Step 1 – Download the document in either Adobe PDF or Microsoft Word (.docx). Step 2 – In the header area in the upper-left part of the page enter the Preparer’s information (name and address) and where a copy of the recording will go to after the form has been filed (usually the new owner or “Grantee”). Grantor’s Name and Status (Status can mean relationship such as “single” or “married”. If it is an entity then write the type such as “corporation”). Step 4 – Insert the legal description which is usually detailed by each jurisdiction after performing a search in the respective County Property Database. After entering the data the form is now complete and ready to be signed in the presence of a notary public. Step 5 – After the form has been acknowledged in accordance with Section 11.002(c) the form may now be filed, along with the required fee, in the Recorder’s Office located in the County Clerk’s Office.